To use the docusign integration to mark up documents for agents you will automatically be taken to the docusign page when you create or edit an onboarding template from the Settings > Onboarding Template section. To see how to add an agent to the system please click here. 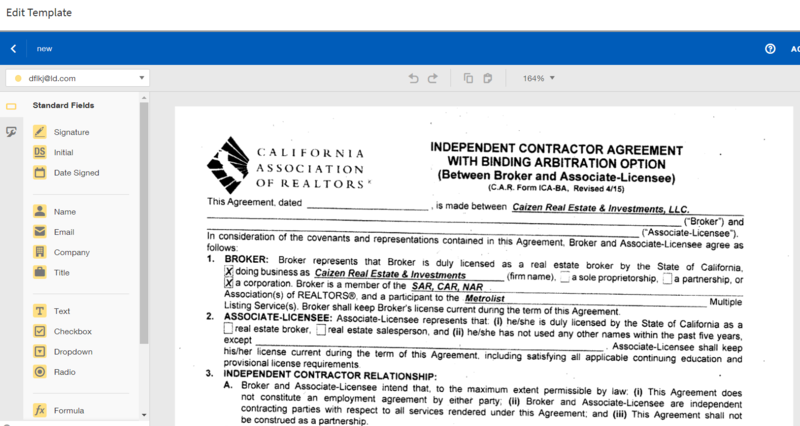 Once the Docusign window opens up you can mark it up. Repeat as needed through the document until you have the document marked how you prefer. Follow the same steps by dragging and dropping from the menu list. After you have verified all the fields are accurate click Save and Close-If you do not click save and close your documents will not save. You will be taken back to Brokersumo and you can complete the steps to send out your onboarding package. Note- You will only need to mark your documents the first time they are saved per template. You will need to mark them up on each new template you create.